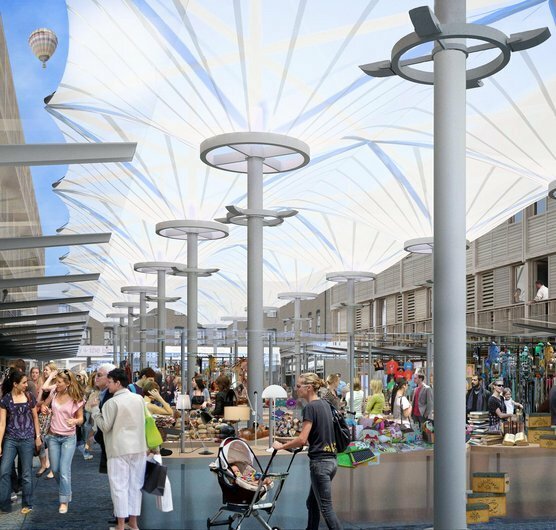 Hopkins Architects have recently submitted planning proposals for the regeneration of Greenwich Market after extensive consultations with market traders, local retailers and other stakeholders. Sensitively responding to the setting designed by Joseph Kay in 1830 and part of the Greenwich World Heritage Site, the design will create a new focus for Greenwich Town Centre with the market at its heart. A 100-bed boutique hotel, shops and studios will be built and the market square is to have a new fabric canopy roof, to give the market a lighter, more spacious feel. The project is programmed to be completed by 2012, in time for the Olympics.